Beans (roma II and half runners as well as blue lake and organic blue lake beans), blackberry plants, blueberries, broccoli, cabbage, cauliflower, cucumbers, handmade crafts, herbs, hickory nuts, lettuce, okra, onions, peppers (sweet banana and Jalapeno and Cheyenne, habanero & green), potatoes, squash (patty pan/acorn, zucchini, yellow & miscellaneous squash), sweet corn (bodacious and peaches and cream), tomatoes (green and vine ripe and roma), and a great selection baked goods, jams and jellies. We are starting to see a better selection of beans and peas at the market. Tn. white crowders, purple hulls peas, speckle field peas, Dixie peas, Mccaslan beans, blue lake, Kentucky Wonders and half runners. Growers are telling me that their egg plants are coming along and should have some at the market this coming Saturday. A couple of the growers are starting to set up on Tuesday afternoons at the Arts Center. What’s better than some fresh okra, sweet corn or tomatoes for supper? Drop by the Arts Center between 3 p.m. and 6 p.m. to get the great selection of Cannon County fresh fruits and vegetables. 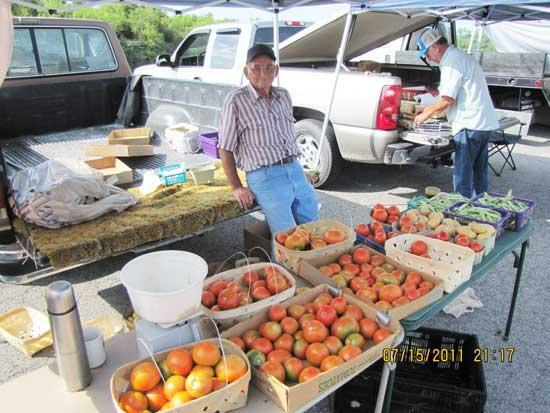 The Cannon County Farmers Market is located at the Cannon County Arts Center every Saturday beginning at 6:00 A.M. The Market has a vast selection of locally grown fruits and vegetables along with baked goods, crafts, jams and jellies and an occasional blackberry plant. Our producers are proud to offer locally grown farm fresh produce. Most Saturdays the market is open until noon or until the farm fresh fruits and vegetables have been sold. Best way to get the best selection is to come early! Also this week, local vendors will distribute recipes provide by Erin Nichols, TNCEP Program Assistant. Mrs. Nichols also plans to have fresh homemade salsa samples from 8:00 a.m. to 9:00. If you need more information concerning the Cannon County Farmers Market, contact Bruce Steelman at the Cannon County Extension Office (563-2554).